PGL is proud to announce its next FIFA 19 event, the FUT Champions Cup March Singapore – in partnership with eGG Network. The event is part of the EA SPORTS™ FIFA 19 Global Series and will take place between March 8-10, 2019. This event will have a total prize pool of $100,000 and 20,000 Global Series Points that will be allocated between the top finishing competitors. The 64 competitors, 32 on XBOX and 32 on PlayStation, will fight for the first place consisting of $50,000 and 1,500 Global Series Points. The grand final will take place between the XBOX One and PlayStation 4 champions. 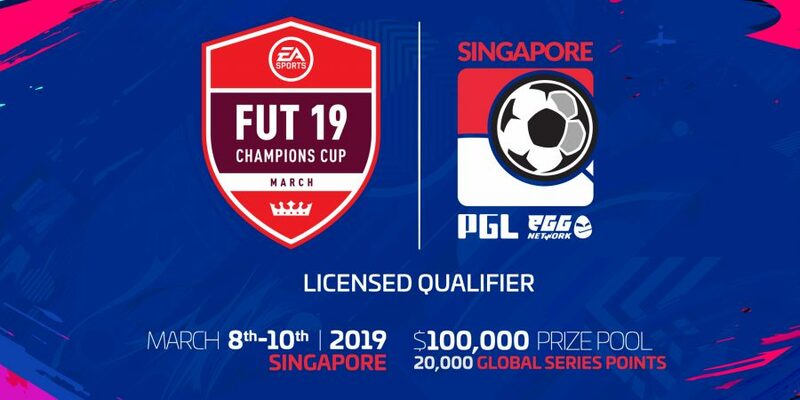 FUT Champions Cup March Singapore will be the 5th FUT Champions Cup event of the FIFA 19 Global Series season, and the fourth of five FIFA 19 events hosted by PGL, after the FUT Champions Cup November, the PGL FIFA 19 Cup Bucharest and FUT Champions Cup January. Another Licensed Qualifier hosted by PGL will take place in May. FUT Champions Cup March Singapore represents one of the last chances for the pro players to earn points in the FIFA 19 Global Series on the Road to the FIFA eWorld Cup™ 2019. More information regarding this event, such as the participating players, schedule and talent line-up, will be released in the coming days. Besides the PGL channels, fans can also watch and follow the tournament on eGG Network’s social platforms and TV channels in Singapore, Malaysia, Brunei, Philippines, Indonesia, Thailand, Myanmar and Australia.